With all of Britain’s current turmoil, there was a desperate need for something to bring everyone together and for something to celebrate. Que – London’s Men Fashion Week. With fashion heavy weights such as Bodybound, D.Gnak, Gravalot, Xander Zhou and many, many more showing off their newest collections, this was a fashion show sure to impress. 2017 marked the 5th anniversary of London Men’s Fashion Week and as the runways produced outfit after outfit of bold and eccentric designs it was clear that the event will continue to go from strength to strength. So, what trends worked their way along the runway? We’ve picked out our favourite trends that are set to make an appearance in your SS18 wardrobe! Vertical Stripes Making a notable presence on the runway were orderly and structured designs. Vertical stripes are a pure classic and there is no sign of them ever truly leaving us. Perfect for both casual and formal occasions, this versatile print allows for plenty of individuality too. Experiment with the thickness of your stripes, from thick blocks to the all-time favourite pin-stripe; vertical stripes are an absolute MUST for any fashion conscious individual. So thank the heavens Songzio and E Tautz have refreshed the vertical scene and laid down the path for vertical stripes to reconquer 2018. Graffiti Style Graphics As if to challenge the ordered patterns that graced the runway – graffiti was another popular print this year with fashion designers such as Brooks Brothers and Vivienne Westwood adding some carefully curated chaos to their designs. Many of the designs showed inspiration from a blending of pop-art or slogan styled themes, resulting in show-stopping, abstract clothing. For those who like to make a statement in the street, these are upcoming designs that will surely get you noticed for all the right reasons. Tie Waist Jackets Knowing the typical British weather and the 3-4 days of summer they have each year, it’s no wonder that waist jackets are to make an appearance in SS18 collections. 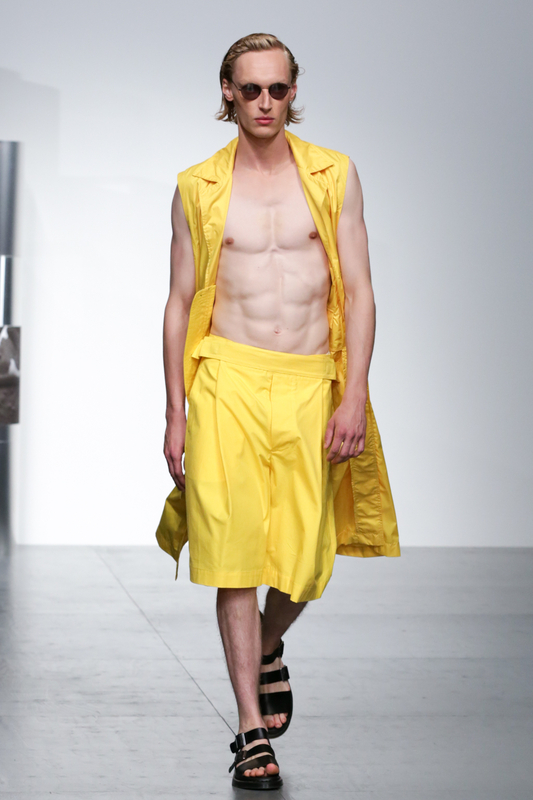 Fortunately, designers such as Daniel W Fletcher and Topman have made sure that you look hot despite any bad weather! These jackets will, without a doubt, stand out from the masses of overcoats and other traditional jacketed-wear. Get on board with this trend early or get left behind! Block Colours. Find your favourite colour and buy everything in it…. everything! Okay. Designers such as Pheobe English and Berthold showed us that everything from highlighter tones to blacks and blues can, and should be worn head to toe.